“We live here, we eat here and we try to take care of the people that live here,” he said. He and his fellow members — who hail from Berlin and Voorhees — took care of the less fortunate residents in Berlin Borough and the surrounding communities by providing more than 100 turkey boxes that included everything a family needed for Thanksgiving dinner. They met early Saturday morning on Nov. 19 at ShopRite in West Berlin where the boxes of food were prepared and ready to go. The boxes included stuffing, cranberry sauce, corn, green beans, potatoes, rolls and pumpkin pie. 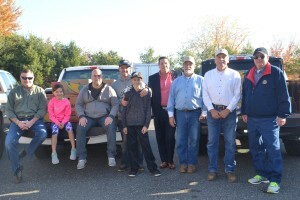 The Rotary Club loaded the boxes onto four pickup trucks and donated them to GIFT Food Bank at The Holy Communion Lutheran Church in Berlin Borough on Saturday, Nov. 19. GIFT provided turkeys, which was put together with the boxes of food and then handed out in time for Thanksgiving. God’s Interfaith Food Table is a food pantry that provides food distribution to those in need. The Rotary Club also delivered 100 turkeys to Berlin Community Elementary School and Dwight D. Eisenhower Middle School in West Berlin the day prior. Even though Rotary Club member Randy Von Der Tann has volunteered at this event for many years, when he pulled into the church parking lot and saw the line of people waiting outside, he was shocked. “I’ve seen lines in the past, but that line was probably the longest line I’ve seen that early in the day,” he said. Von Der Tann is a fourth-generation Rotary Club member in his 10th year, but said he’s been involved with the club his entire life. “Rotary has been in my blood my entire life growing up as a kid,” he said. He is getting his children involved early, just like he was brought up with it when he was a kid. He took his children to ShopRite and the church to see the work they do and to show them how fortunate they are. Mike Denomme of Berlin Borough echoed his fellow member’s statements, saying they put others before themselves, especially this time of year.